The Edwardian-style conservatory is just one of a range of rooms our conservatory design and installation team are specialists in. Contact us to discuss your project with our fitting and design experts. A sloping glass roof creates the illusion of more space and a light, relaxed living area. The four-sided, pitched glass roof allows plenty of light creating a well-ventilated, temperature-controlled and spacious living space. 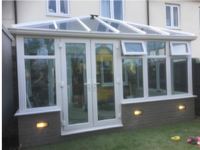 The Edwardian-Style conservatory is a popular choice with customers seeking a traditional conservatory, the style of which will enhance and compliment properties of all periods. Add a touch of classic elegance to your home as well as extra living space which you can customise with a choice of decorative finishes.